I spent so much time thinking about this book as part of judging the Cybil finalists, I'm so glad I can finally share it! This book has a unique voice and shows a side of life that I haven’t often seen in picture books. It won the Newbery Medal this year and also a Caldecott Honour for the illustrations! 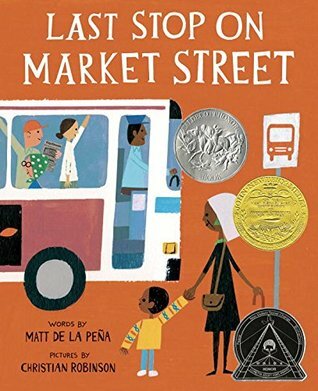 Last Stop on Market Street was written by Matt de la Pena and illustrated by Christian Robinson. It was published by G. P. Putnam’s Sons, an imprint of Penguin Group, in 2015. I loved the way this story is told almost completely through a child's eyes, even though it is written in third person. The voice drew me in and made CJ's personality come alive. I think kids will really be able to relate to CJ. At the same time, the language and phrasing is poetic and creates interesting visual images in my mind, right from the beginning. The writing style is fresh and unique. The bright, paint and collage illustration style reminded me of The Snowy Day by Ezra Jack Keats. I enjoyed the way this book showed CJ in his real life, offering readers a glimpse of reality. CJ's many questions were great, showing his curiosity -- and could be the springboard for many discussions or to provide an intro for making a “wonder wall” in the classroom. I liked the message: “Sometimes when you’re surrounded by dirt…you’re a better witness for what’s beautiful.” This could be a great quote to discuss with students. Use collage to create a piece of art that shows a scene you might experience on your way to school. Have you ever been on a bus? Write a story or draw a picture to show what happens on a real (or invented) bus trip! Talk about the setting. What details do you notice about CJ’s community from the illustrations and the story? Listen to a piece of music with your eyes closed, like CJ did. What colours do you see? How do you feel? To learn more about this book, check out this wonderful interview with Julie Danielson of Seven Impossible Things Before Breakfast -- Last Stop on Market Street: A Visit with Matt de la Pena & Christian Robinson. A space adventure is not the first book I’d pick up when I’m looking for something to read, but I heard Wesley King speak at the Packaging Your Imagination Conference for writers and illustrators in November and that made me curious. His book is also one of the nominees for the 2016 Silver Birch Fiction Awards from the Ontario Library Association. When Jonah wakes up on the Fantastic Flying Squirrel, he’s a bit confused. One second he is in his family’s living room doing his homework, and the next he’s sitting on a very cold floor on a very cold ship with a very strange-looking girl staring at him. Her name is Willona the Awesome, and she’s here to welcome him to The Incredible Space Raiders. 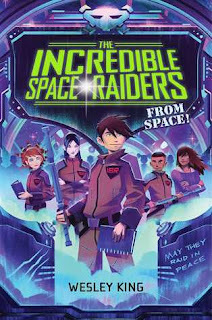 Now that Jonah is on board, the Incredible Space Raiders can set off on an important mission: to venture into the Dark Zone and save the universe from the Entirely Evil Things. But when Space Raiders start to disappear, Jonah realizes that if he’s going to make it to the Dark Zone alive, he’s going to have to step up and figure out what’s going on. 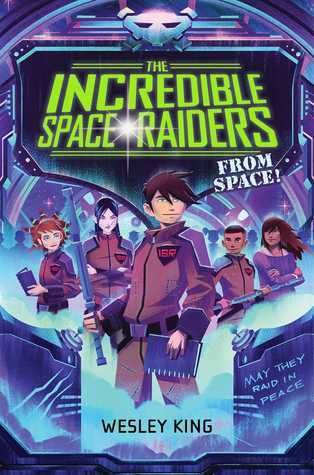 The Incredible Space Raiders from Space was written by Wesley King and published by Simon & Schuster Books for Young Readers in 2015. This science fiction adventure is an entertaining read! It’s funny, full of action and there’s also a mystery to solve. If you’ve ever dreamed of waking up one day and suddenly being put in a situation where you’re expected to save the day, you’ll be able to relate to Jonah. He’s a likable character who takes on a tough mission, despite doubts that he’s even supposed to be there. From a writer’s perspective, I thought the author was especially good at writing believable middle grade dialogue. Wesley King is the author of YA novel, The Vindico. At the Packaging Your Imagination Conference, he gave this valuable advice for writers: "Take the time to find your story and believe in it." This beautiful wordless picture book is the winner of the 2015 Cybils Award in the Fiction Picture Book category! I am so proud to have been a part of the judging process to choose this lovely book as the winner. One of the things that surprised me the most about it was that even though it's a wordless book, there was a writer as well as an illustrator. In Canada, this book won a Governor General's Literary Award for Children's Illustrated Books 2015. It was also selected for the New York Times Best Illustrated Children's Books of the Year 2015. 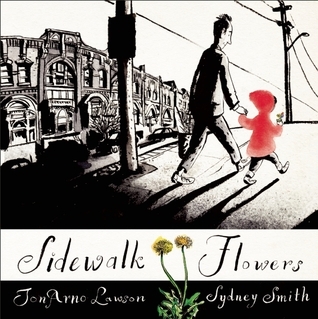 Written by award-winning poet JonArno Lawson and brought to life by illustrator Sydney Smith, Sidewalk Flowers is an ode to the importance of small things, small people and small gestures. Sidewalk Flowers was published by Groundwood Books in 2015. I found it very interesting that even though this is a wordless book, a writer created the story. I loved the idea that to really appreciate this book, you need to stop and look, which is what the girl is doing in the story. A post from Groundwood explains how this book came to be and the author's role in the process. I really loved the simple, pen and ink drawing style and the effectiveness of the growing use of colour. I noticed the realistic expressions on the girl’s face, showing the pure pleasure she gets from finding and giving flowers. There is so much lovely detail in the illustrations, it is a book you can return to and explore again. Although this book may be more effective in a small group or one-on-one than in a class read aloud, I really liked the subtle encouragement to stop and notice, to give without expecting anything in return. Because it is wordless, this book is accessible to all sighted students, no matter what language they speak. In sharing this with a group, I would probably “read” through the book by showing each page slowly, then go back and “re-read”, this time describing with students what is happening on each page. Create a black and white drawing showing a scene you walk past every day. Use a hint of colour to highlight something that people might not normally notice. Compare what the girl and the father are looking at as they move through the story. Are there any changes as the story goes along? What do you think the author is trying to say? Does the story need words? Choose your favorite page from the story. Explain why it’s your favorite. For older students, it would be interesting to read and compare this book with The Man With the Violin by Kathy Stinson and Dusan Petricic. Where does the illustrator choose to add colour? Why? I’d heard a lot about this book, but the title didn’t draw me in, so I wasn’t prepared for how much I would love it. It’s compelling historical fiction with a great story about persevering despite economic, physical and emotional hardships. Nine-year-old Ada has never left her one-room apartment. Her mother is too humiliated by Ada’s twisted foot to let her outside. So when her little brother Jamie is shipped out of London to escape the war, Ada doesn’t waste a minute—she sneaks out to join him. So begins a new adventure of Ada, and for Susan Smith, the woman who is forced to take the two kids in. As Ada teaches herself to ride a pony, learns to read, and watches for German spies, she begins to trust Susan—and Susan begins to love Ada and Jamie. But in the end, will their bond be enough to hold them together through wartime? Or will Ada and her brother fall back into the cruel hands of their mother? The War That Saved My Life was written by Kimberly Brubaker and published by Dial Books for Young Readers (Penguin Group) in 2015. From a writer’s perspective, I thought the opening chapter was very effective at setting the stage for the novel and providing information the reader needs to know. It was interesting that Ada had a realization about herself so early in the novel. “Ada! Get back from that window!” Mam’s voice, shouting. 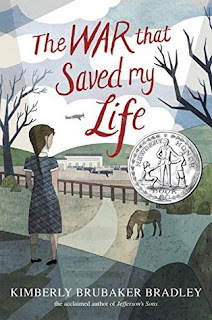 The War That Saved My Life won a Newbery Honor Medal in 2016. Kimberly Brubaker Bradley has written several other historical novels. As a teacher, I'm always on the lookout for books that help children identify and manage their emotions. This picture book is nominated for this year’s Blue Spruce Award from the Ontario Library Association. The hero of this picture book, Sam, has to wait for everything on the playground one day, and this makes him mad. He got madder and madder until he was the maddest he had ever been in his whole life. And then, suddenly, an unusual thing appears. It runs around, shoving and tripping and pinching and stomping, until all the other children have run away. It was hanging upside down from the monkey bars, grinning at him. Sam had never seen anything like it before, but he knew what it was. It was a Temper. At first, having a pet Temper is fun. But before long, the Temper starts causing trouble for Sam. And eventually, Sam comes to the realization that his Temper is something he needs to learn to control. 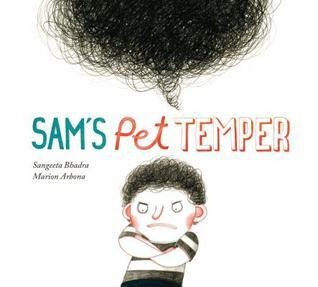 Sam’s Pet Temper, written by Sangeeta Bhadra and illustrated by Marion Arbona, was published in 2014 by Kids Can Press. The writing has some great images and language: “The Temper hissed. It thrashed. It lashed out like a giant angry snake.” The author has really captured how it feels to be angry. Many children will be able to connect with and relate to this story. Even though this book is recommended for ages 5 – 7, it feels lengthy in comparison to the shorter style picture books I’ve seen lately. This book offers lots of possibilities for discussion about feelings and being angry. I was a bit cautious about the concept of feelings as a separate entity, which could suggest it’s okay for a child to blame their actions on “the temper” rather than taking responsibility. But I liked how it shows a way to think about anger and also included a couple of strategies for calming down, such as taking a deep breath. I don’t know if I liked the ending – passing along the Temper resolves the problem for Sam but not for the next child. Re-read the story and talk about the situations where Sam’s Temper seems to be in charge. What different way could he have handled the situation? Act out a new way to solve the problem. Make a list of words to describe angry feelings. Choose three and put them in a poem or story. Draw a picture of your own “Temper”. Think of one way you can keep it under control. To find more great picture books to read or to use in your classroom, visit author Susanna Leonard Hill's website for her theme-based summary of Perfect Picture Books posted by book-loving bloggers on Perfect Picture Book Friday. At first, I wasn’t sure I would relate to the characters in this story. But as I kept reading, I got more intrigued and wondered what might happen to Jacob’s eccentric grandparents. This is another book from the short list for the 2016 Silver Birch Fiction Awards from the Ontario Library Association. Coping with the recent death of his father, twelve-year-old Jacob Mosher is sent to spend the summer with his aging, estranged (and strange!) grandparents in a rural seaside town. Reluctantly, he trades the security of his foster mum and a big city for a blind grandfather, Frank, who dresses like a sea captain and conducts flag-raising ceremonies, and a quirky grandmother, Pearl, who sometimes forgets her dentures. Jacob has two short months to figure out how to deal with his ailing grandfather, the surging river tides and the family secret that’s haunting his newfound grandparents. 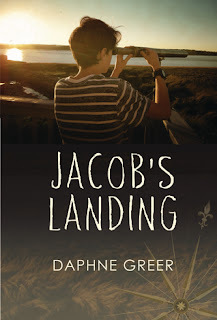 Jacob’s Landing was written by Daphne Greer and published by Nimbus Publishing in 2015. I haven’t read many middle grade novels where grandparents have such a large role in the story. At first, like Jacob, I wasn’t sure I’d like reading about them because they seemed so quirky and eccentric. But as the story went on and the conflict increased, especially Jacob’s wonderings about how they might cope after he left, I wanted to find out what happened. I really liked Jacob’s friend Ruby, who seemed bold and adventurous, though sometimes she acted a little too quickly before she thought about the possible consequences. As a writer, I enjoyed the way the author created such distinct characters through the use of details and different personality traits. They really came alive for me through their actions and dialogue. Daphne Greer lives in Newport Landing, Nova Scotia. I didn’t know what to expect from the title of this book, but was immediately drawn in by the story. This is a wonderful story of kindness and community – a great classroom read for all elementary grades. A drought has settled in the area around the orphanage where Boniface lives. There are long line-ups at the tiny spring where all the local people get their water, and suddenly the orphans are pushed to the back of the line, unwelcome. Boniface's houseparent, Henry, tells him that the people were mean out of fear--they feared there would not be enough water for their families. When the building of the orphanage's well is completed, Boniface has an idea to help the villagers. A lovely story of kindness and heart, this story shows that, through compassion and understanding, true generosity can spring from unexpected places. Hope Springs was written by Eric Walters and illustrated by Eugenie Fernandes. It was published by Tundra Books in 2014. This longer picture book opens with a playful introduction to the children at the orphanage to hook the reader in and introduce the characters, even though the problem of not enough water is a serious one. This really began to create a lot of emotion and feelings for the characters, because of the weighty problems and realities of life they need to face. The illustrator uses realistic, earthy tones that clear showing the details of the story and add to the emotional impact through the character’s gestures and expressions. This is an important book to read to elementary students. Along with showing the realities of life in Kenya, the scarcity of water and how kids can help, it also shows how kids can take action to be kind and change their situation. I enjoyed reading the facts about the water and Eric Walter’s role in helping to bring water to the orphanage and village. 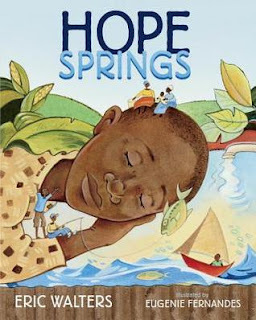 This book could provoke a lot of discussion and would be great to pair with other books that show more about the water cycle, e.g., Water Is Water by Miranda Paul or about life in other places. Talk about what your life would be like if there was a water shortage…would North American life be different? What would change?